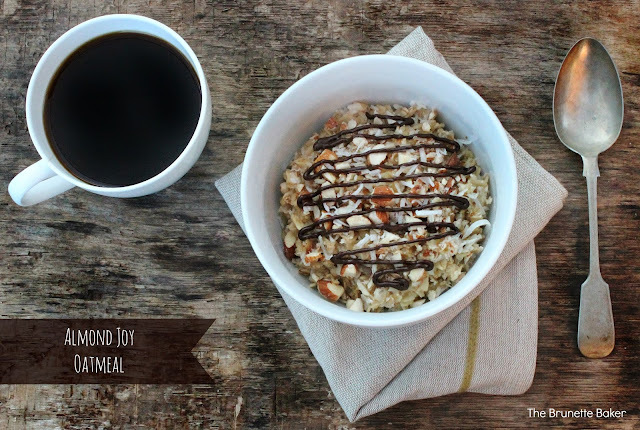 Almond Joy Oatmeal - and a $200 Amazon Gift Card Giveaway! I'm going to make this post short, but very sweet. In more than one way. If you're looking for a different kind of breakfast, this is where it's at my friends. I make this oatmeal at least once a week - and I do not apologize for it either. It's simple. It's quick. It's like eating a candy bar at 8am and not feeling bad for doing so, although eating an actual candy bar for breakfast has never been seen as an issue for me. (Hello? University years?) I know you'll thank me, so indulge. (Recipe after the jump). Now for the really sweet part - I've teamed up with some fabulous bloggers to help my lovely friend, Anyonita, of Anyonita's Nibbles celebrate a big milestone - and we're giving YOU the chance to win a $200 Amazon Gift Card! It's super simple really. All you have to do is use the Rafflecopter below to enter, follow the easy instructions, and jot down all the ways you would spend $200. This delicious giveaway is open to everyone worldwide. In a saucepan over medium-high heat, bring milk and water to a simmer. Add in oats and allow to cook for a minute stirring. Bring liquid to a boil and stir constantly. Do this for about 5 minutes or until most of the liquid has absorbed. Add coconut. Remove from heat. Add salt, brown sugar, cinnamon and flax seeds. Stir until blended. Allow flavours to meld together for about a minute. Transfer oatmeal to a bowl and top with chopped almonds and a bit more coconut. Drizzle chocolate over top. Serve hot. I need to get better about oatmeal-this looks like a super tasty way to do so! The photograph of your breakfast has such great composition. Sorry if that sounds weird... but I appreciate stuff like that. It's a nice snap shot - and I bet super tasty! Pinning now because who doesnt love almond joys and oatmeal? ty for sharing this.